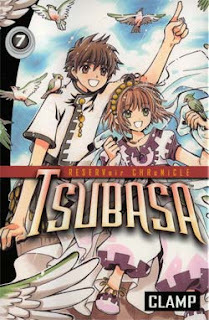 Syaoran continues the search for his beloved Sakura's missing memories, which take the form of powerful, magical feathers, as he and his companions travel from one alternate reality to the next. The delightful Mokona, a cute little rabbit-like critter with a great sense of humor and the ability to transport them from one world to another, accompanies them, along with warrior Kurogane and the former wizard Fai. The country of Oto, where our heroes find themselves this time, is an odd one in which those with warrior skills can earn money by battling wicked, demonlike beings called Oni. This is a fine way for Syaoran and Kurogane to spend their time while they search for the feather, and it is hilarious to see that Kurogane is beyond irate when he discovers that Fai has signed them up as Oni fighters called "B ig Puppy" and "Little Puppy"(Kurogani is the Big Puppy). When they hear there is a strange, new type of Oni that is more powerful than all the others, they suspect the presence of a feather may have something to do with the demon's enhanced abilities. 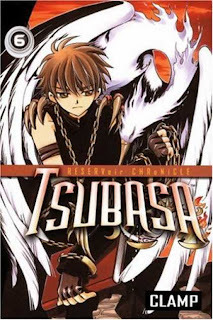 The story continues in volume 7, as Syaoran discovers there is another visitor to this dimension, someone from his own past. It is the powerful warrior Seishiro, who trained him years ago. Despite the fighting skills he's been learning from Kurogane, Syaoran knows that he doesn't stand a chance against someone as skilled and experienced in fighting as Seishiro - but going up against him is his only choice if he's to win back Sakura's feather. I continue to enjoy this series, with its mix of humor, romance, martial arts, action and fantasy adventure. As Sakura regains her feathers and memories, she becomes a more active participant in the stories, and while she has led the sheltered life of a princess, she is turning into a brave and feisty heroine with some unusual abilities of her own. Her upbeat, optimistic attitude continually draws the unlikely group of friends together, and the interplay between them all is alternately humorous and touching. These two volumes are a departure from the formula of the earlier books, which makes me doubly curious to see which direction the story will take from this point. Have you reviewed either of these? Let me know, and I'll add a link to your review. I wish my library had these... or that it would be made into a video game lol. Ladytink - If they made it into a videogame, I'd definitely buy it!